The GT-MotoLady custom motorcycle build for charity carries on even though Sofi Tsingos and I are in different states. In case you missed the introduction- GT Moto and MotoLady have teamed up for a charity motorcycle build called GT-MotoLady. The base bike, a MV Agusta Brutale 800, is our chosen victim. 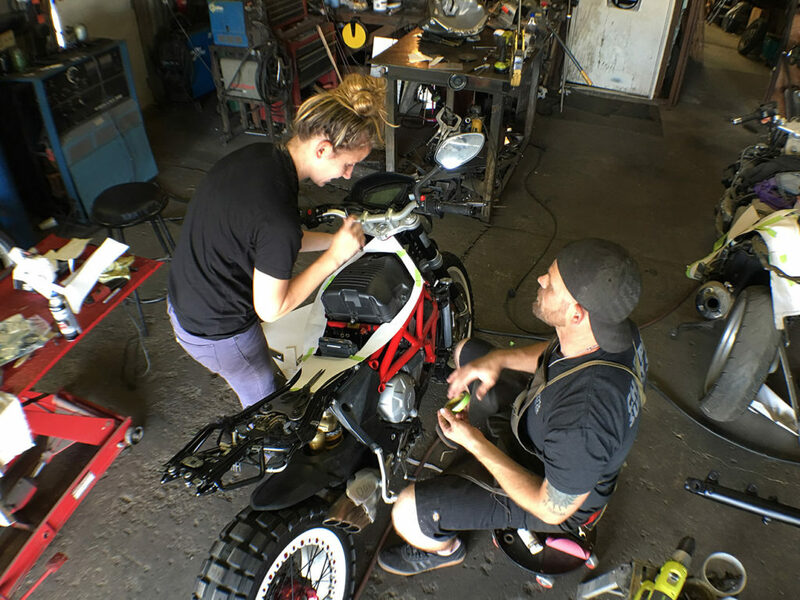 Read more about our design and planning process in the GT-MotoLady Motorcycle Build for Charity article. As you can see in the above photo, we’ve equipped the Brutale with spoked wheels from a Dragster and Continental dual-sport tires. The colors will change, but the effect is remains the same. The single sided swing arm, wide tire, and classic spokes make for a clean combo. 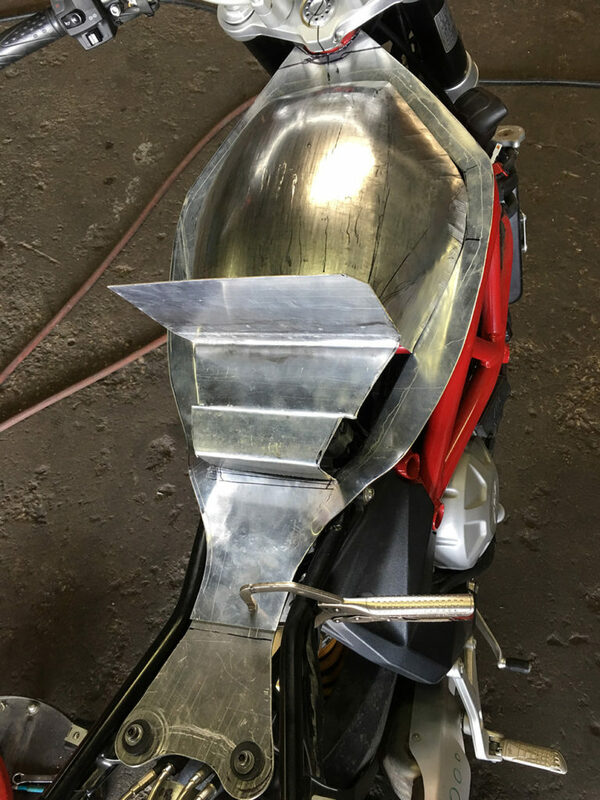 Recently Junior Burrell, the owner of RetroMoto, and Sofi Tsingos, got together to work on the fully hand built custom aluminum tank and tail section. Junior is a well known metal fabricator and bike builder in Fort Worth, Texas. Sofi was following the RetroMoto work for years before she finally met him at Rockers Vs. Mods in Dallas four years ago. Sofi and her father George both admired his work and wanted to shake his hand, and when they got talking bikes they became fast friends. That was the same year that Papa and I decided to build our first raffle bike and asked Junior if he would want to help out. 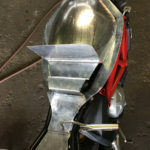 I wanted to learn metal shaping and build the tank and seat using aluminum, and he was the perfect guy to learn this dying art. The tanks he builds are so good that he was completely booked up- so him taking on another project seemed like a long shot. Fortunately for us he liked the project and what it stood for. At that time, the only things he knew about me was through Facebook. I think Facebook kind of makes me look like a stuck up rich Daddy’s girls who only rides Ducatis… and that’s what Junior assumed as well. He has had so many people ask him to teach them what he knows- but no one ever followed through. So he figured if I actually wanted to learn then I’d actually show up every Sunday at 6:30am. His shop is an hour away… but I did it. I had no idea that he only told me to be there that early to test me, I just thought he was a morning person. So that is how Junior became one of my best teachers and the best big brother. This year I asked Junior if he would like to be part of this year’s raffle build, and of course (because he’s awesome) he said yes! 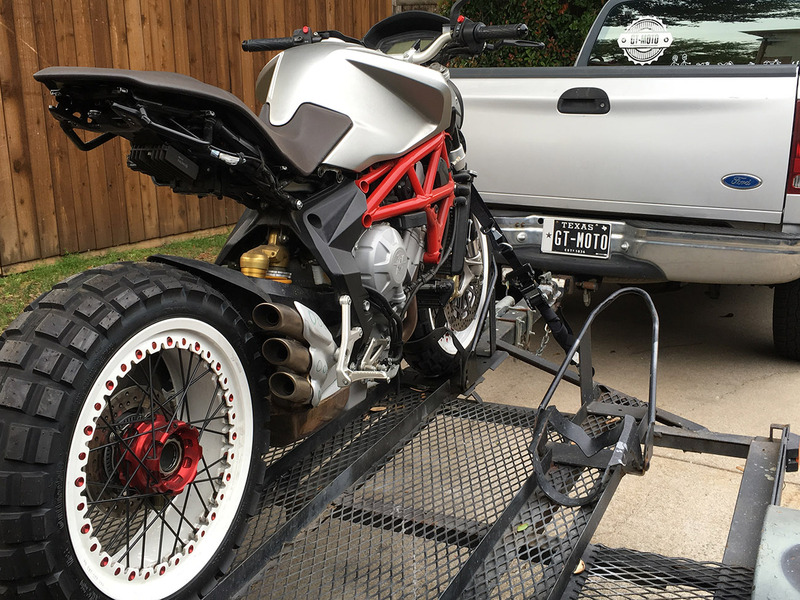 This weekend I loaded up the Brutale and headed to Fort Worth. This time I didn’t have to be there until 9am (haha) and the plan was to just get a game plan and an idea for the how we will make the design work. One of the challenges is that the MV Agusta Brutale is fuel injected which means there is a fuel pump inside the tank. The bike is so compact that the measurements have to be perfect! We started by making a template, and once we had the shape for the first bottom piece we traced it on a sheet of aluminum and cut it out. Next we started creating the tunnel that will have the fuel pump mounted in it. Sunday was the hardest day for me. Junior teaches in a way that I have never been taught before. For example, I had to make the round piece that goes over the airbox. It looks simple, but there are a few different directions that the FLAT piece of metal has to actually go in. He reminds me how metal acts when changing it, he even goings deep into explaining how atoms act when annealing (softening the aluminum) and then hammering on it. He shows me and then has me go try it while he gets to works on his other projects. Shaping metal is one of the hardest things for me to do. Not to understand but to physically do myself. It is the most gratifying feeling I could ever have once I see the finished product, though. 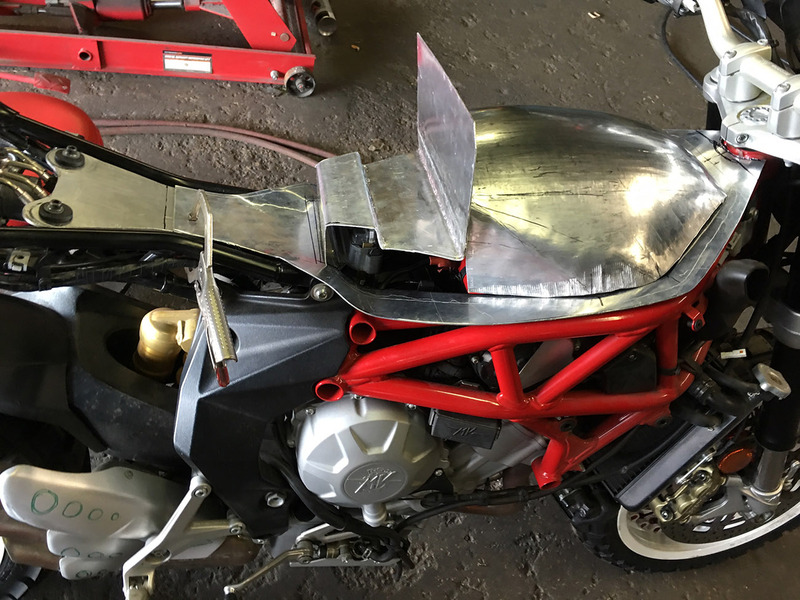 Because of the fancy MV Agusta ECU tuning, we opted to keep the airbox in tact, so that adjusting the bike for the new exhaust we plan to put on the bike will be relatively simple. Having a fully custom map created is not the easiest task. Visit the RetroMoto and GT Moto websites. I’ve been thinking about how it was done, so many identical alloy tanks – for the first year CB1100RB with 1050 bikes plus a few spare tanks I suppose – surely they might have known they’d produce the bike for the next year’s 1500 units and the 1500 units for the final year of 1983? Well even if they DID know it would be upwards of 4050 tanks to make, one has to wonder just how automated the process might have been. I had always gone on the assumption that they “Flow-Formed” the sheet Aluminum in hardwood “buck” moulds – And indeed, upon very close examination while polishing the living heck out of this specimen for the “toaster-tank” look, I found something of an “end-grain” pattern left in the metal. In certain areas this pattern changed from tiny but uniform end-on circles & dots, to an angled pattern with an oval slant which varied with the curvature of the form. Meanwhile the welded seams seemed hand laid…. There’s no question in MY mind anyhow, that the process was halfway between the mass production methods use on the period’s steel tanks, with the neat lines of robotic welding, perfectly shaped sheet-metal stamped out of enormous hydraulic dies, etc – and the one-off individual hand-made tanks more commonly see in Aluminum. So naturally, one has to wonder whether the process could be “reverse-engineered” for a copy tank as close to the original as possible. Barring that possibility, perhaps an injection-moulded polyethylene version in semi-opaque white – Which just might pass for a spare part for track bikes. Fiberglass being a no-go due to the way fiberglass tanks crack on impact & leak gasoline all over the rider – Bit of a flaw in that design, IMHO. I suppose there are some new materials out there such as the HEMP-based composites, purportedly less apt to cracking. In any case, I’d really rather have ’em made as close as possible to the original. 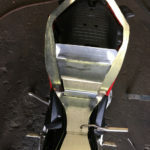 One has to wonder with all of the mass-produced alloy tanks, replicas for the old British bikes from out of India right now – Would THEY be using these “Flow-Forming” techniques? 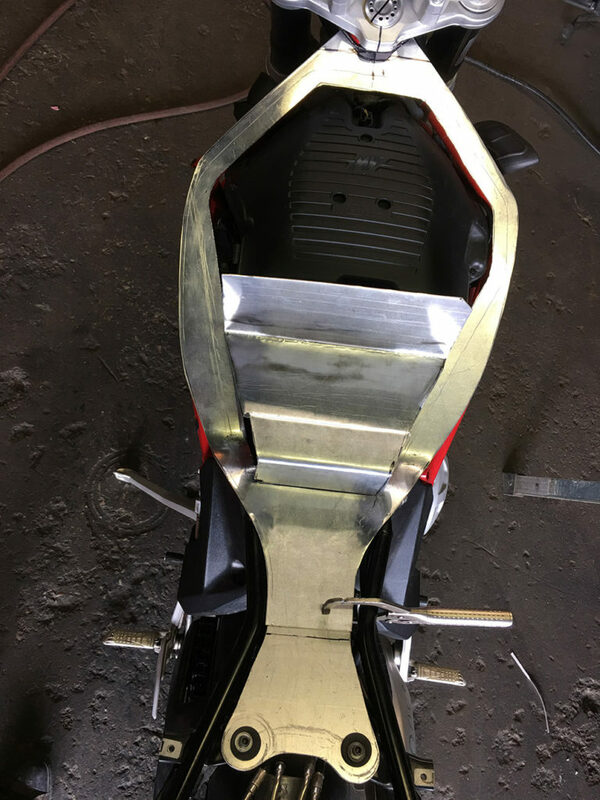 Most pics I’ve seen of SOHC-4 CR750 & CR450 etc replica gas tanks online, it looks like folks are doing everything by hand, one-by-one – Some of ’em seem overly heavy, armour plated boxes with the corners beveled down smooth. And yet they’ve been a massive success, relative to other replica bodywork products well of the gas-tanks anyhow they’re probably the most commonly seen. Meh. On the other hand all of those Norton Manx extended-range tanks seem to have flooded the market first and foremost. 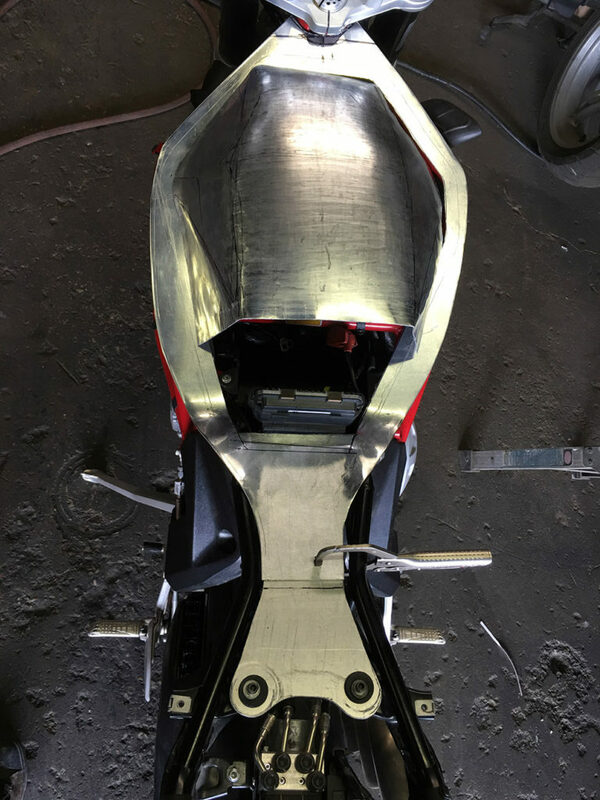 Well to MY mind at least, the CB1100R alloy tank makes a very good argument for being yet another success story – but only IF somebody were to replicate the same process as before. No English-Wheels, no hand hammering no measuring to templates & doing it all over again – Just a huge stack of flow-formed panels. 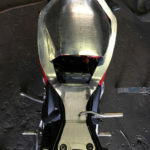 Interesting to note that the CB1100R tank has an invisible seam running down the top center-line. It really simplifies one’s image of the thing, knowing that it’s really only the two side panels, the belly/tunnel – a reinforcing baffle on the inside, some thick tube pipe work (two nested pipes sliced on an angle) plus some small trim pieces to create the tail where it’s bolted down, some cups for the locating bungs up front, and the cap threads are a separate … “beer-can” structure inserted after the fact. Which is to say, it’s really no more complicated than most other bike tanks once you realize how it’s put together. Relatively speaking, a flat smooth top as it appears to be, in one smooth panel – joined to the two bulging sides and finding a way to match the edge of those rounded/dented double-curved sides against the straight sides of that single flat top panel, well…. Yeah – it seams quite daunting. The three panel tank however, to ME anyhow it seems a revelation! That’s not why I see it as a decent project for batch-production though. It helps, but you need to have a market for the things. And IMHO there’s a HUUUUGE market for these tanks. Not only for all of the ’79-’83 DOHC-4 models, but in a slightly modified (tunnel only) form, fit for the 2010-2016 CB1100s??? Whoa. They’d sell like Hot-cakes in Japan. It’s a tall order, getting somebody to build these tanks AND to convince the Morad company to dig the tooling for the old Akront “NERVI” center-flanged rims out of moth-balls, so that one could build some ridiculously awesome widened COMSTAR rims – But once these two ideas come together – And well, somebody will need to whip up some aftermarket FRAMES for the new CB1100 motor to shoe-horn into, for a replica of the 2007 Tokyo Motor Show’s “CB1100R” prototype – ‘Cause people are gonna wanna build THAT one as well. But just looking at all what was and still is (rarely) available for the ’79-’83 engines – Chassis from the likes of Bimota, Magni, Harris, Moto Martin, Egli & Rau, Bakker, etc etc. Well it would be fantastic to see at least one or two of ’em done up for the NEW CB1100 – And besides that, there are sure a lot of surviving bikes out there. 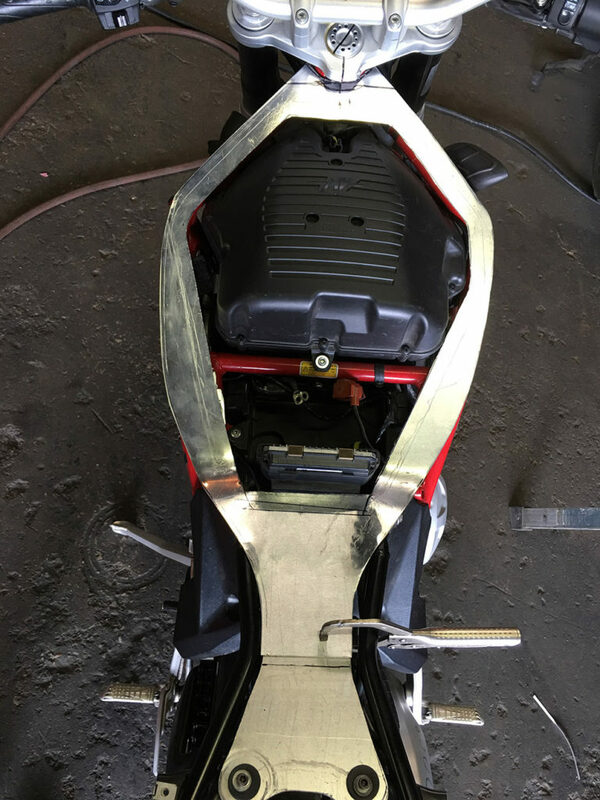 A company such as PAUGHCO would do well to stop making their hard-tail chopper/bobber frames for Harley Davidson altogether – and start off with a run of Bimota HB1 frames for starters. 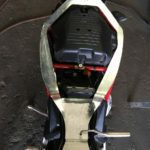 To produce the ’70s-’80s aftermarket “Cafe Racer” frames for Japanese inline-four “UJM” engines, heck I’m sure there’s more POTENTIAL business out there than the residual Harley chop market however much of it remains – Maybe even more than there ever was, if they were to produce the same old’s-cool backbone twin-shock tubular-steel chassis for motors such as CBR/VFR, Gixxers, – what HAVE you. Just as it’s been somehow acceptable to build the retro-fried choppers around the new Harley twin-cam & Evo engines, the aftermarket big-bore “ORCA” motors, etc – Well IMHO there could be equal support for some retro-fried old’s-cool builds centered around all of these fugly CROTCH-ROCKET bikes. Whoops. I slipped up and forgot you were working on the MV Agusta Brutale. Heh-heh. Speaking of which – Your tube-less wire-spoke rims. IMHO these are entirely unnecessary and misguided designs – Because regular wire-spoke rims can be sealed up tubeless with aquarium sealant etc, provided they’ve got the bead-retention ridges. But even beyond that argument – there’s an even more awesome wheel project centered around DIY Aluminum welding: Just as there are (or were) the Kosman Industries’ “Weld-Widened” cast/mag RIMS – there’s a new or seemingly new method of a weld-up HUB – Saw it done on a CB900C wire-spoke conversion by one Mike “6pkrunner” on the http://www.cb750c.com forums – Interesting to note that it’s the same entire shaft-drive rear end as the GL1100 Gold Wing, but it doesn’t even matter that it’s based around a Comstar hub, ’cause it isn’t one of those bolt-up flange kits – it could work on ANY rear wheel hub – The existing wheel hub/core is cut down to a cylindrical spool on the lathe, and then a drum hub is hollowed out from side-to-side. Then the two are welded together with neat rings of welding. Only instead of the meticulous jig-work and machined surfaces, care for concentricity & alignment etc which were so important to the Kosman Industries’ Weld-Widened Wheels – in this case it’s the wire spokes themselves which correct any serious misalignment in either planar or concentric alignments! And where the Kosman wheels involved four rings of full diameter high-spec hand welding by very well trained technicians, the HUB is of a much smaller diameter for one – the hollow drum hub needs only the two rings of welding and four would be for the case of new flange plates on either exceedingly large or exceedingly compact new hubs the like of which have never been seen…. For instance – I’d like to take the idea of the CBX550F wire-spoke conversions, the bolt-up flange plate thing with all of it’s extra weight and puny 230mm rotors (albeit vented type, much like my CB1100R 296mm rotors) this whole “Faux-Leading-Shoe” fake DRUM hub idea – I’d like to take this idea and run with it. Not just the CBX550F hub but how about the PC800 Pacific Coast hub, with it’s 276mm rotors and lightweight construction, or the GL1500 front hub with it’s 296mm OEM rotors or upgrade to 316mm rotors from GL1500SE rear brakes. This seems like another pipe dream, I do realize. And welding on a wheel hub sounds so antithetical to the K.I.S.S. and “don’t fix it if it ain’t broke” axioms. But just think of how much safer this would be than running an actual 4LS drum on a huge heavyweight ’70s-’80s Superbike! What prompted me to think about this wasn’t so much this whole “CB900K0 Bol Bomber” project, but rather … In looking up the same dinky 200mm Suzuki 4LS drum hub that I’ve put on my teenage Ex-Daughter’s “KZ440LOL”, I’ve seen this same little brake on several large bikes where it poses serious questions as to the builder’s sanity – Most notably on the CBX1000 six-cylinder based Hailwood Replicas, where the theme calls for a 4LS drum and well, there are several such Hailwood Replica sixes out there, using larger 250mm & 260mm 4LS drums – But I’ve gotta ask whether ANY of these original drum hubs are appropriate for a bike like this. Not only because of the speed – ’cause Giacomo Agostini etc rode DOHC-4 500cc Grand Prix racers at or above the speeds attainable by the basic OEM package DOHC-4 CB900F, CB1100R, CB1100F – or CBX DOHC six cylinder 1000cc/1050cc bikes – However those racers may have been fast but they’re nowhere near as HEAVY as a proper late ’70s Superbike or “Touring Rig”! So yeah – IF it’s at all possible to package the 296mm rotors & TRAC anti-dive into a more aesthetically pleasing, “retro-fried”, package – One that might well be more affordable than the authentic 4LS replica drums. It might well help to create a far stiffer wire-spoked wheel, too. Only one way to tell. Sorry for blathering on. It’s just that – Well I can tell that ya’ll at THEMOTOLADY are of a like mind, that you too believe that classic aesthetics & even some of the technology, could lend itself to the future generations of new motorcycles, electric motorcycles even. I mean, if you’re putting wire-spoke rims and an Aluminum gas tank on that BRUTALE you’re building? That says a lot!